The Galaxy S8 isn't oversaturated, but the white balance is way off here. Finally, let's look at this orange traffic cone in the grass. Yes, you might think the GS8's image is more pleasing, but it's really "greenifying" everything. The G6's colors may be more dull, but it's far more accurate. And if you zoom in and look closely at the grass you'll see a lot more variation in color. Samsung's color's pop, but far too much. This grass isn't nearly this green in real life. The browns and yellows in the grass on LG's image aren't as pleasing, but reflect the true colors. Samsung has long been criticized for taking too many liberties with color saturation and intensity, and while its image processing seems to have improved, it's still not nearly good enough. Too often, its colors simply don't reflect reality, or it has trouble nailing the white balance of a scene. Samsung needs to aim for accuracy in its auto modes, and leave this intense color stuff for its "creative" modes. Next, let's check out clarity. When we talk about clarity, we’re looking at both the sharpness of the image (resolution and fine detail) as well as image-processing artifacts. We want to see an image that retains small details and fine textures, without introducing a lot of noise or edge artifacts from over-sharpening. Let's take a look at this bright daylight shot in Las Vegas. Both cameras did a great job with detail and noise in this bright daylight shot. We see similar detail and noise between the two phones, and they both do a great job. Just look at this close-up, where the slats around those tiny windows are easily visible. Both phones do a great job with sharpness and noise in bright outdoor light. How about this close-up of a circuit board in bright indoor lighting? Which phone will bring out the fine details of this circuit board? Here, the Galaxy S8 pulls ahead, with more details and fine writing visible when you look closely at the chips. The text printed on the circuit board is crisper, too. The Galaxy S8 has crisper text and fine lines on the circuit board. Let's take a look at a really low light scene, with some color/detail photo targets thrown in for good measure. The lighting in this scene is exceptionally dim. And it's going to make a big difference in final photo quality. It's just no contest. The Galaxy S8's bigger sensor and wider aperture give it the advantage it needs to expose both the model and the photo targets. The G6 just couldn't keep up. It ruined the model's skin tones and facial detail, and completely destroyed the photo targets. The G6 couldn't keep up with this low light scene. Just look how bad the photo targets are! In bright daylight it's pretty close, but the darker it gets, the more the Galaxy S8 shines. A larger sensor with bigger pixels, and a slightly brighter aperture, give it a real advantage in capturing detail and reducing noise in darker environments. Winner: The Galaxy S8 takes clearer, less noisy shots, especially in low light. Finally, let's look at dynamic range. Here we’re going to look at the dynamic range captured by the camera (the difference between the brightest and darkest possible areas captured in a single image) and the way the camera chooses to expose the image, including tone mapping and HDR. In this first shot of a series of AV plugs, we see a pattern that will repeat itself throughout these tests. Both shots look good, but the Galaxy S8 exposes a little more brightly. This isn't a problem in this shot, but it will be in others. The Galaxy S8 looks good, and doesn't lose any information, but it's exposed more brightly than the LG G6. LG's exposure is one or two stops darker, but there's no lost information and the image looks balanced. We start to see the consequences of Samsung's high exposure settings in this next scene. Both cameras create a pleasing overall image, but look closely at the woman on set and you can see the highlights blown out in her hair, her sleeves, and the objects on the right side of the table. Samsung produces a pleasing image, but highlights are blown out a little. The G6 manages to properly expose dark areas while not losing detail in the brightest spots. This shot of a lighting booth at a trade show really demonstrates the difference in dynamic range. At first glace, both shoots look good. But take a look at the round lights on the left side. You can see the black lines for the little support rods. Those are totally blown out on the Galaxy S8. Both phones manage to keep detail up in the dark areas of the ceiling, however. The Galaxy S8 totally blows out the lights on the left. The G6 retains fine details in the lights, as well as detail in the dark areas. Both phones are leagues better than those of years past, but the Galaxy S8 has a tendency to slightly overexpose images, and often blows out highlights in challenging scenes. Winner: The LG G6 simply does a better job of keeping the brightest and darkest areas of a scene exposed properly. The LG G6 retains its crown in our smartphone shootout series. While the Galaxy S8 takes better photos than the S7 did, despite similar specs, Samsung still has a little work to do. Locking on to proper white balance in challenging scenes is tough, and it still over-saturates colors, especially bright greens (like grass and trees). Again, this isn't a measurement of all aspects of a smartphone's camera. There are lots of factors to consider: dual-camera modes, special camera app modes and features, shutter latency, video quality and features, and more. But when we closely examine the color, clarity, and range of these two cameras when used as most people do (in auto mode), LG clearly comes out on top. 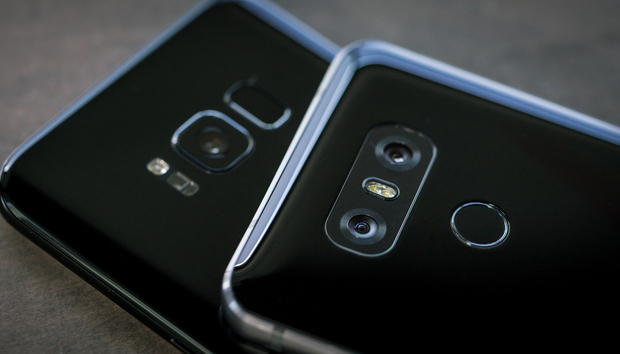 We think smartphone buyers will be really happy with the camera on either phone, but Samsung's going to have to do a little work if it wants to with this challenge with its next phone.